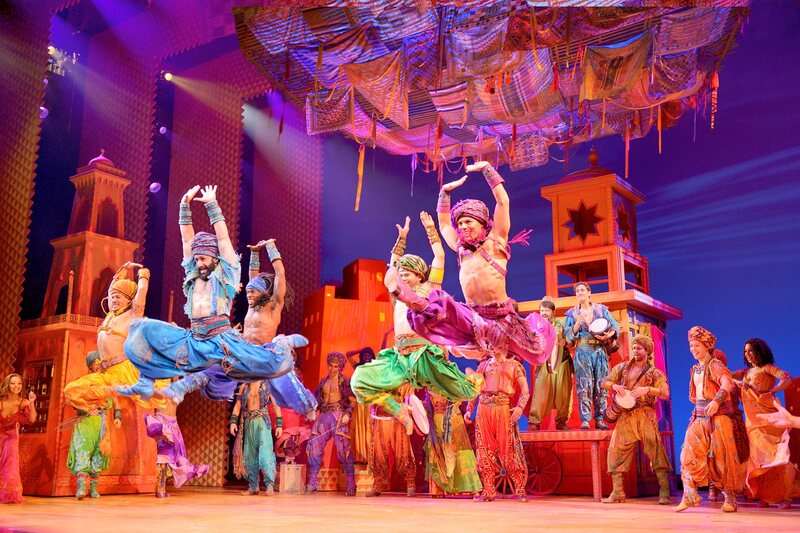 Theatre Review: Disney’s ‘Aladdin’ Grants All Our Wishes at The Fabulous Fox! Like most people living today, I grew up a child of Disney. My VHS copy of 1992’s Aladdin was no stranger to the VCR, and the film remains one of my favorite animated features to this day. So it goes without saying that a stage adaptation of the beloved classic had a lot to live up to. And I’m happy to report that Disney has worked their magic once again to create a theatrical experience that not only exceeds expectations – but builds upon the source material to create a show that even tops the original! The show features the iconic music by Alan Menken, with lyrics by Howard Ashman and Tim Rice. All of the songs you know and love are here, along with several new additions which fit the show wonderfully. Book and additional lyrics by Chad Beguelin. By now most everyone knows the story of Aladdin. The titular hero of the tale (CLINTON GREENSPAN) lives life on the streets of Agrabah, stealing and scraping by just to survive. Yet he always puts others before himself, sometimes to the dismay of his three closest friends and partners in crime: Omar (PHILIPPE ARROYO), Babkak (ZACH BENCAL), and Kassim (JED FEDER). For those of you wondering, these roles were condensed to create the character of Abu in the animated version. They work very well as a trio here, and are a lot of fun – especially in their big number, “High Adventure,” which is my favorite new song. Meanwhile, Princess Jasmine (LISSA DEGUZMAN) is unhappy with her life at the Royal Palace, and her father The Sultan’s (JERALD VINCENT) neverending attempts to match her with suitor after suitor to be married. While disguised, she escapes to the marketplace where she meets Aladdin, and the two of them form an instant connection. And what would a Disney story be without an evil villain? Of course, The Sultan’s Royal Vizier Jafar (JONATHAN WEIR) belongs to this tale, accompanied by his sidekick Iago (JERALD VINCENT). 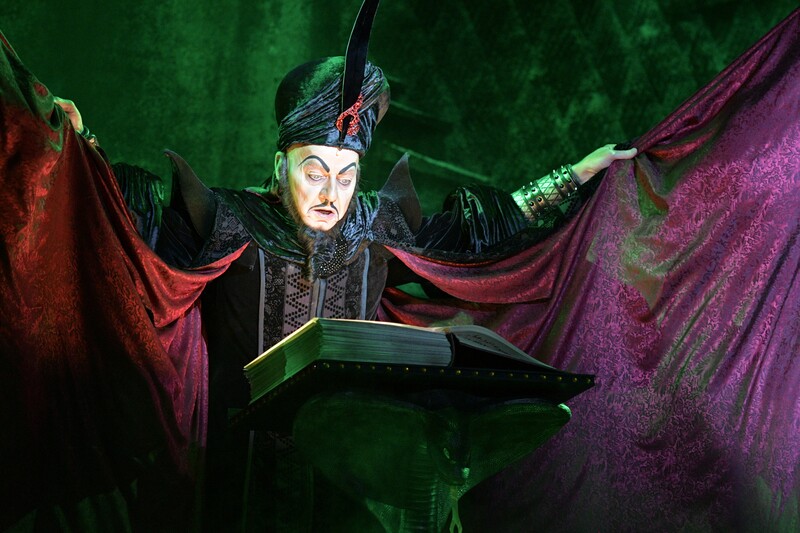 Jafar plots to take over the kingdom, but first needs to obtain a magic lamp from the mysterious Cave of Wonders. Through a magical vision, he is told that only the “diamond in the rough” can obtain the item, who is shown to be Aladdin. Jafar convinces Aladdin to retrieve the lamp, yet things don’t go quite as expected when the thief touches a forbidden treasure. Trapped in the cave, Aladdin manages to rub the lamp and reveal an all-powerful Genie (MICHAEL JAMES SCOTT) who grants him three wishes. Aladdin must decide whether or not to use the wishes on himself, to win the favor of Jasmine, or to help Genie escape his life of servitude. Read our interview with Jonathan Weir. Aladdin is truly a sight to behold live and in-person, spectacular in every sense of the word. Those familiar with their other theatrical productions, like The Lion King and Beauty and the Beast, know that Disney spares no expense when bringing their classic to life for the stage. 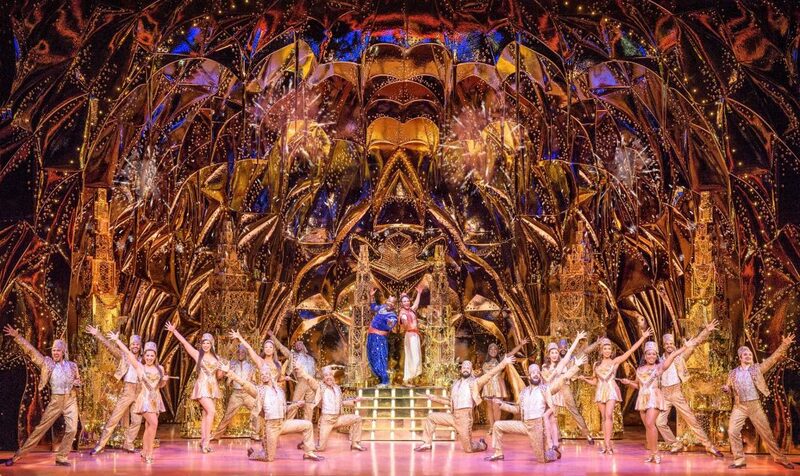 The sets are breathtaking, meticulously crafted and elaborately designed to transport the audience to Agrabah. The way sections of the stage masterfully drop in and out from the above gives a real depth to the surroundings, beautifully capturing the magical kingdom. Kudos to Bob Crowley, who is responsible for the scenic design. The costumes throughout the show by Gregg Barnes are gorgeous, full of vibrant colors and dazzling designs. All of the outfits from the kingdom’s subjects on the streets to the palace’s inhabitants look terrific. But the real “piece de resistance” is the jaw-dropping array featured in the number “Prince Ali.” The closest thing I can compare it to is the opening number of The Lion King. It really is magnificent! The production features a huge ensemble, and they all come to amaze during the song. 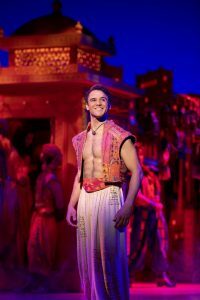 Speaking of impressive numbers in the show, the one everyone will be talking about long after seeing the show is without a doubt, “Friend Like Me.” Taking place in the unbelievably detailed Cave of Wonders, this song featuring Genie, Aladdin, and the ensemble is nothing less than a showstopper. Michael James Scott is as magical as they come, bringing the iconic character of Genie to life for the stage, and his performance along with the rest of the casts is incredible. The number ended with the longest hold for applause I have ever seen, and it deserves every second of it. If audiences weren’t already sure they would walk away happy, this is the moment that seals the deal. Scott is hilarious throughout the show and a true comedic talent. Before seeing the show, another scene I questioned how they would do it is the magic carpet ride in “A Whole New World.” I have to say, they really pulled that one off as well in charming Disney fashion. Casting for the show is terrific, and really felt true to the 1992 film. Greenspan perfectly captures what makes the character of Aladdin great, with his charm and charisma – and above all else, the character’s heart. He and deGuzman share a great chemistry, and it’s fun watching their relationship blossom throughout the show. Jasmine has always been a very strong character, and this inception is no different as the actress plays the headstrong princes true to form. Weir does a fantastic job of capturing the evil Jafar, without ever feeling like too much of a cartoon. It’s a fine line to walk, especially when dealing with such an iconic character. Yet the veteran actor plays the role just right, coming off as just the right mixture of sinister and larger than life. Jay Paranada is fantastic as his henchman, and much of the comedic relief in the show. The two of them are a lot of fun to watch interact. No matter how old you are, or whether you are going to Aladdin with the entire family or for date night: prepare to be delighted. Disney has done it once again, taking their iconic stories and characters, matched with iconic musical numbers, and brought them to life for the stage. Everything you love about the animated classic is here, along with new songs that live up to the originals you remember. It’s a dazzling, magical production full of spectacle and wonder. There is no doubt, if you are a fan of the original, that you will not want to miss this incredible time at the theatre. 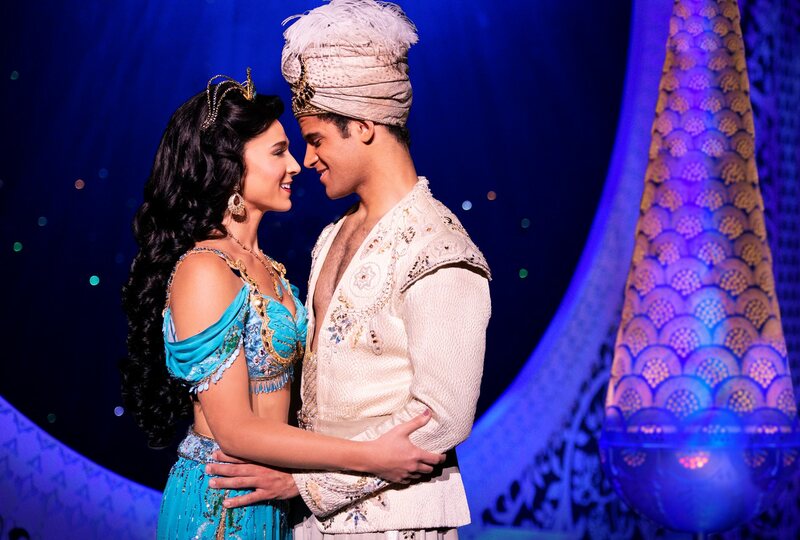 See Disney’s Aladdin now through November 25 at The Fabulous Fox! Tickets range from $27 – $199, and are available at MetroTix.com. For more information, visit the Fabulous Fox website or the official production page at AladdinTheMusical.com.